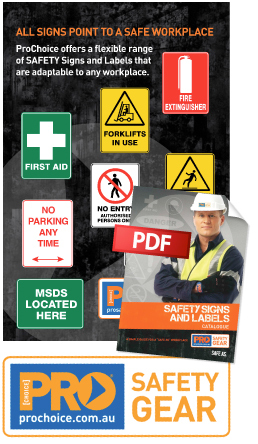 Whereabout Supply are distributors for the ProChoice range of Safety Signs and Labels. Please click on the link to view the entire range available. Signs can be ordered by emailing us at sales@whereaboutsupply.com.au or call us on 1300 943 732. Follow the process outlined in the catalogue to determine the stock number and size that you wish to order. Please allow 5 – 7 days for delivery. It’s that simple. Please check and ensure that you’ve ordered the correct catalogue number as we are unable to refund or credit charges for incorrectly ordered signs. Pricing for items not displayed is available on request. Prices displayed are excl GST.